The first-graders were jubilant. After some trial and error, they had figured out how to build a sturdy bridge—and gotten a thrilling taste of what it’s like to solve a design problem. The bridge had to support three heavy figurines representing the Three Billy Goats Gruff. And a “troll” figurine had to be able to fit underneath. Success didn’t come easily—“Earlier in the week they did some preliminary building, and they couldn’t get the goats to stay on,” said their teacher, Therese Koellner. The students were using a learning kit provided by a grant from the Cranford Fund for Educational Excellence in support of STEM (science, technology, engineering, and math) education at Bloomingdale Avenue School. Mrs. Koellner sought the grant to give students early, hands-on exposure to STEM concepts, which fosters critical thinking and collaboration skills that will help the students build upon these concepts in the upper grades and on through high school. But she also wanted the students to develop an empowering mindset. By working on engineering tasks in particular, students learn to persist and work through their frustration when they don’t get something right the first time, Mrs. Koellner said. “That ability to problem-solve and be creative extends to every other aspect of their day, including writing and reading,” she said. The grant paid for eight Lakeshore Learning kits—four apiece for the first and second grades—that are meant to integrate science with other skills and subjects. The first-graders’ kits have a fairy tale theme that dovetails with their reading unit, and the kits include journals in which the students write their reflections about their experiments. Mrs. Koellner’s first-graders began their bridge-building by studying pictures and videos of bridges and making sketches of what theirs would look like. They discussed support beams and ramps and trusses and angles of support in class. 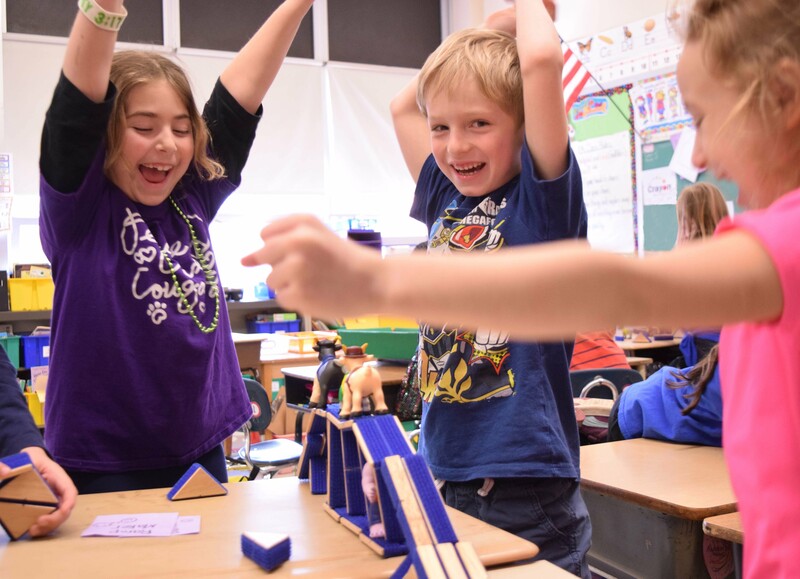 “They did a lot of research,” and showed “significant growth in their reasoning ability,” as she once saw when they were trying out some preliminary ideas for their bridges, Mrs. Koellner said. “They were doing challenging work and creative problem solving in a group. I was very impressed with the connections and extensions they made to other areas of learning that we do the classroom,” she said. Along the way, the students have clearly imbibed the kind of collaborative spirit that will help them in later grades and, eventually, in the workplace, where employers are likely to emphasize cooperative problem-solving. Also notable is the girls’ performance. “I’ve seen a pretty level playing field,” she said. “In the past you had seen the girls take a back seat because they don't play with Legos as much as the boys do. The girls are right in there figuring it out.” She has also seen some of the more introverted students becoming more engaged.